A spinner bait is one of the most popular and now iconic lures in the bass fishing industry. Spinner baits really caught fire the 60s and quickly dominated with their effectiveness. According to Wikipedia hey spinner bait is defined as; a family of fishing lures that get their name from one or more metal blades shaped so as to spin like a propeller when the lure is in motion, creating varying degrees of flash and vibration that mimic small fish or other prey. Spinnerbaits attract numerous predatory fish. Although, the most common may very well be bass. Spinner baits have grown in popularity because of their innate ability to mimic pods of baitfish. Similarly to fishing crankbaits for bass, spinnerbaits can be tweaked, tuned, and manipulated to have tremendous success on the water. A spinnerbait can have various shapes, sizes, weights, blades, skirts, and trailers. Adjusting these components allows for specific targeting of bass Depending on weather and water conditions. In the world of spinner baits there are three predominate blades throughout the industry. These three blades include the Willow leaf blade Colorado blade in Indiana blade. Spinnerbait blades offer flash, vibration, and movement. Let’s cover these in a little more detail. By design Willow leaf blades run at higher speeds then there are other counterparts. The longer taper allows for the blade to act more true when coming through the water. This is it to say that Willow leaf blades cannot be retrieved slowly. Smaller, wider, less carpet blades have the ability to run slower through the water. Willow leaf blades are generally ran in tandem with other blades. Designed for faster retrieves these blades offer maximum flash. Willow leaf blades can be ran in tandem with another willow leaf blade, a Colorado blade, or Indianna blade. The uniqueness about the Colorado blade is it’s rounded design. With it’s almost circular shape and cupping these blades allow for a much slower retrieve. Colorado blades by design create vibration more so than Willow leaf blades. Often times anglers will use Colorado blades On spinnerbaits around dense vegetation, low visibility water conditions, or night time. They are equally as powerful and down timber, rocky shoreline, and mats. The Indiana blade has a more tear drop shape. These blades were designed to be used under moderate water conditions. The shape of the Indiana blade offers an ability to be retrieved at moderate speeds. That speed just between the willow leaf blade and the Colorado blade. They offer more flash than a Colorado, but less than a willow leaf. At the same time the offer more vibration that a willow leaf, but not as much vibration as a Colorado blade. The skirt of a spinnerbait rivals the blade when it comes to their importance in the water. While the blades offer a unique vibration, flash, and movement, the skirt offers the true value of mimicking bait pods. The action and color of the skirt will alert fish as to the realism of the lure. When using a spinnerbait under clear water conditions, using a red skirt would be ill advised. This may alert fish to key in on the fast that this is not natural. Spinnerbait skirts come in all colors and often times has multiple colors mixed throughout. As a general rule, here are the best colors to use for all water conditions. When using spinnerbaits in clear water, stick to the more natural colors of your bait fish. Colors such as clear, green, silver, and blue will all provide realistic imitations. Variation of these colors are also acceptable. A skirt that is mostly clear, mixed with some silver stands, and green strands is just one example of optimal color match. Semi stained water conditions are almost ideal for spinnerbaits. This allows for some “wiggle room” when it comes to variances. Here we will want to move away from your standard clear water colors and start adding some more bold coloration. Spinnerbaits that are silver, white, and chartreuse will allow your lure to be seen under these water conditions. Adding purples, bold greens, and even black is acceptable here. Low visibility water condition allow for anglers to really get creative when it comes to color selections. The standard clear water colors can be thrown out here. When fishing under low visibility anglers should rely on dark bold colors. Colors such as red white, and black are going to be at the forefront. These colors allow for the spinnerbait to be seen from greater distances. Refer to the blade selection of this article for optimal performance with these colors. Under low visibility water conditions the blade is of the utmost importance. When it comes to spinnerbait trailers every angler is going to have a different opinion. Some prefer larger trailers that really add some bulk to the bait while other anglers prefer smaller more subtle trailers. The purpose of the spinnerbait trailer is to add more “body” to the bait. Trailers such as the Zoom Split Tail offer a smaller profile to a spinnerbait. The standard length is about 3 ½ inches with two tentacles that come off the back. These can be purchased at most sporting good stores. 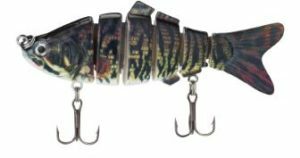 Another option is the Strike King Chaca Chunk trailer. This is more of a craw imitation that offer a medium body to the spinnerbait. The Chaca Chunk can be purchased at the larger sporting good stores typically or online. Lastly, and my personal favorite is something like the Zoom Swimming Super Fluke. This is a small soft plastic swimbait produced by Zoom however you can substitute any small plastic swimbaits. These baits although not intended to be a spinnerbait trailer offer a large body profile. The larger profile seems to land bigger fish in my experience. Warriors Tackle Supply Monthly Fishing Subscription: Is it Worth It? I found to new service that seemed right up my alley about a month ago. It’s monthly goody box geared towards people who love to fish. 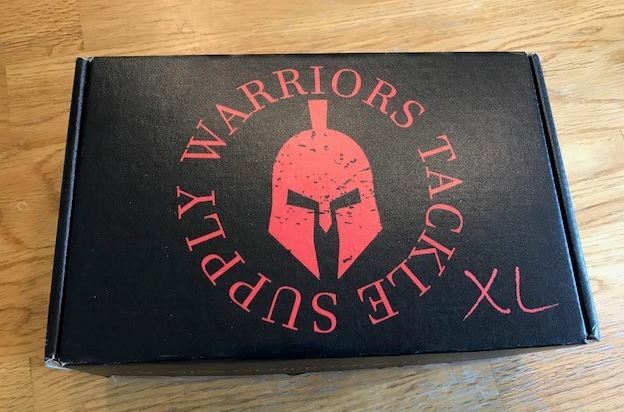 The company that offers this service is named Warriors Tackle Supply. Today, we are going to take a look at what I received in my first box, check the value and see if it is worth the monthly auto purchase. But before we go over all of that, let’s take a look at the company itself to learn more of who is behind this awesome idea. I’ll be truthful here, I do not know much about this company. What I do know is that they have a mission, and that mission is what really caught my eye and pushed me over the edge to give them a try. The founder of Warriors Tackle Supply has a passion for helping children. Adopting a son who needed a home, they also support others in the adventure. They work directly with organizations that meet the immediate needs of children that live on the streets. They also do what they can to bring kids living on the street visible to government, help influence policy and work directly with organizations to help build orphanages. You have two choices to select from in different price ranges. As of when I signed up, you could select the regular size box costing $16.99 and a larger XL box for $26.99. This is by the month and said they membership can be cancelled at anytime by sending them a quick email. I went with the XL subscription, so lets’s take a look at what showed up in my surprise box. So the time came when I got my Warriors Supply Tackle Mystery box, and I was pretty excited. The mystery of not knowing what your getting is like Christmas. When I received the box, I decided to take some photo’s what I got for an article. In the above photo is how the monthly fishing subscription showed up. They have a pretty cool design, I’m hoping they are not all marketing! 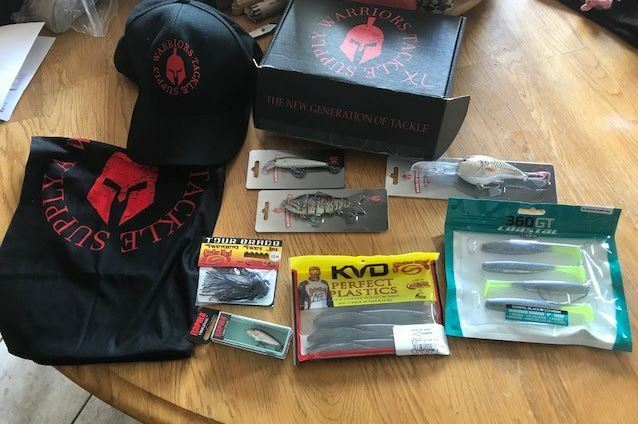 The box came stuffed with fishing gear and even a couple swag items which every man would be happy with. In the above photo is everything pulled out. I’ll go over each item below with value to get a feel of if this fishing gift box is worth it. 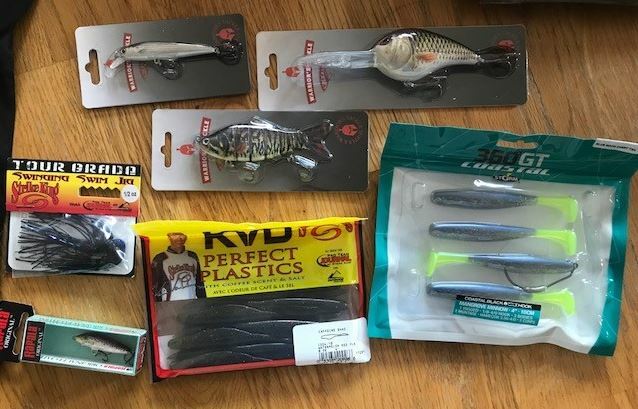 And finally, in the above photo you see a little closer shot of the included lures that was in the box. So, let’s take a closer look at each item. That’s a lot of stuff! It all sounds good, but is it really worth the $26.99 paid for it? My thinking is yes but let’s dive in and see. So, also inside the box was a packing slip with each pieces value. I want of course do my own research and see what type of value I as a consumer think. Warriors Tackle has the Strike King Tour Grade Swinging Swim Jig marked down as costing $6.29. My research shows that they are spot on. Doing a quick Google search, that is exactly what I’m finding them for online. Some places are a little lower and some higher. The Strike King KVD Perfect plastics Caffeine Shad ranges in price depending on where you get it. Warriors had a price of $5.99 which is the priced to match Bass Pro and Cabala’s. I agree with this price. You can see Bass Pro price here. This lure is close to my all time go-to plastic fishing lure the Zoom Fluke. I’m really looking forward to giving this one a try. Also being priced by Warriors Tackle at $5.99 each is the Storm by Rapala 360GT Mangrove Minnow. Another plastic that I’m looking forward to using. Looking this lure up, it is priced at $5.99 at Bass Pro and just a tad cheaper at Walmart and Amazon. Being that the outdoor stores are the same as Warriors price, I can agree with this one as well. Also, Walmart and Amazon are not that much cheaper to take them into account. Warriors has the value of the Rapala Original Floater a little high at $9.29 for me. Their price does match Bass Pro pricing which is even cheaper than Amazon, but higher then Cabala’s and which are about $2 cheaper. On this one, I will be using $7.40 when adding up final value. Regardless, this can be a deadly lure out on the water. I have used them in the past and glad I now have another. It is similar to this HD trout lure here. Fishing creeks, I loose lures and always feel sick getting caught up on something underwater with a lure over $3. Priced at $4.99, the Warriors Tourney Special Minnow 3 is another I’m looking forward to trying out on the lake. I don’t know much about it so I will update this article once I play with it. The one thing I will say is that other branded similar lures are about $1 cheaper. I will be using $3.99 for the final value evaluation. 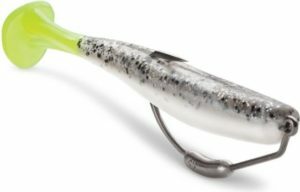 The unique six section flex shad lure is priced at $7.99 at Warriors Tackle. This is actually cheaper than many other lures of the same type. This lure gives great actions and cheaper than others like it. Bass Pro is pushing $18 for simular while other places online are around $10. I will use the Warrior Tackle price on this one. This deep diver just looks like it is out to cause some trouble with any fish that dares to go around with it. Priced at $7.99, I feel this is a good price point and will go with it. Being that I’m not a huge crankbait guy, this is probably the most undesirable lure in the box. Only because I tend to loose them. With that being said, I know just the guy who will enjoy it. If I actually give it up that is! Warriors has this price at $14.99 which I’m torn on. Doing a search for face shields, the price ranges a lot. I found them (after shipping) between $7.99 and $20. Amazon has them in the $8-$15 range. I’m going to go with $11 for the value here. Again, hats can range in value depending on a lot of things. The Warrior Tackle hat with a cool looking logo, is a win in my book. Being that the price of this hat is not listed in the gear layout, I will need to come up with a price. Doing research of other logo hats, I feel $12 is fair and in the range of fishing logo hats at Walmart. Okay, so we went over everything in the box, what Warriors had each piece priced at and what I think they should be priced at compared to similar lures. So let’s take a look at the numbers. So, I want to be clear, this is worth the money in goods for sure. But, it also depends on if you will actually use what they send every month. For me, so far so good. I will use everything in this box besides maybe the crankbait. But then again, I may give it a try just because I have it. If I loose it, so be it. If I don’t, I know my brother in-law will. This monthly fishing goody box would make for a great gift for someone who fishes a lot. I don’t know any fisherman that wouldn’t be thrilled to get this every month. 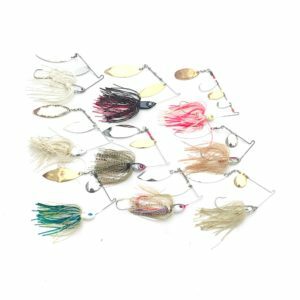 This subscription may not be best for someone who doesn’t fish enough where the lures would just pile up, though getting for a few months to stock up may be a good idea. For me, I’m all in for now. We will see what future boxes bring, I’m already excited for next month!